NOTE: The audio recorder plugin is supported by Firefox and Chrome on the Mac and PC. It is also supported on the new Microsoft browser of Windows 10 (Microsoft Edge). It is NOT supported by Internet Explorer or Safari. 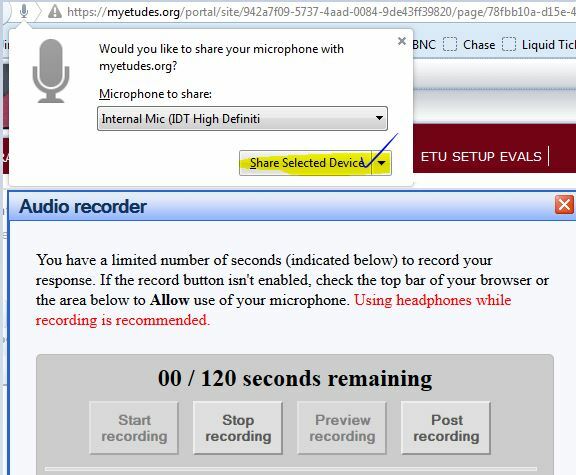 The audio recorder plugin of Etudes allows for recording and sharing audio messages. You can record audio messages directly in the editor using the audio recorder (microphone icon). No other software is needed. The built-in microphone on a laptop is all that you need to share with your browser. Instructors have the audio recorder everywhere where there is an editor in Etudes (i.e. Home Page, Syllabus, Discussions, Private Messaging, AT&S, including grading views, etc.). Students have recording capabilities in Discussions, Private Messages, and in Assessments (inline submissions). Providing personalized feedback to students with audio messages. Give it a try. It is easy and students will appreciate it. The voice recording does not need to be perfect —- pauses are okay. Promote language learning – speaking and listening comprehension. You no longer need to ask your students to leave messages in your phone. Click on the microphone icon in the editor to open the Audio Recorder. The Audio Recorder dialog window will appear. Depending on your browser, you may be asked to share your computer’s microphone with the browser. Choose the share the selected device. ​​To begin recording, click on Start Recording. 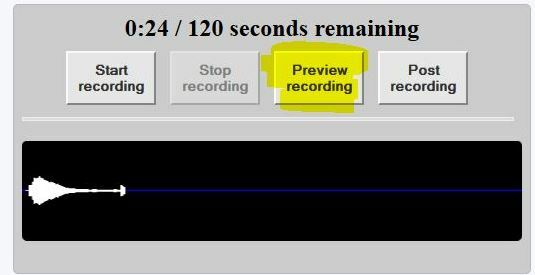 You may record up to 120 seconds of audio. Click on Stop recording when you are finished. Click on Preview recording to see if you are happy with your audio message. If you are not happy with the audio message, click on Start recording to record it, or click on Post recording to post it. Please wait while it is processing and saving the recording. 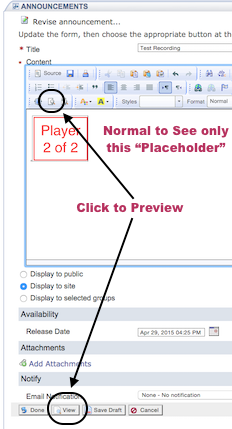 When the process is finished, the window will close and you will see the following “Player 2 of 2” in the editor window. This is a placeholder of the audio file. In the student view, there will be a sound player in its place. To preview the audio recording (and see the audio player) click on View or Preview of the tool, or click on the preview button of the editor (see screen shot). When inserting audio files in announcements, discussion posts or modules, click on the View or Preview function to preview your recording. When inserting sound files in Assessments or home page, you can click on the ‘view’ icon to the left of the name of the item to preview and play the recording. When sending a high-priority announcement that includes a sound recording, it will not play in the student’s email client. It will only play inside Etudes in a browser. 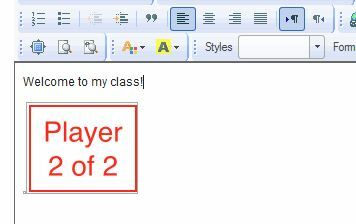 If you require students to submit oral responses in assignments, they will appear with the “Player 2 of 2” in the editor boxes of their submissions. In order to get the media player and play the audio comments of your students, you want to click on the “View” icon of the editor in their submission. This will open their submission in a preview window with the player. You can listen to it, and then close the preview window of the submission, and grade it. If you are sharing the same feedback to an assessment with more than one student, you can copy and paste the source of the same recording to the comments boxes of many students.